The temporomandibular joint (TMJ) connects the temporal bone with the condylar process (flange of bone) of the mandible (jaw bone). There is a TMJ on each side of your skull. The joint provides for all motion of the jaw in relation to the skull, including elevation, depression, protraction, and retraction. The temporal bone is a highly complex structure. Cranial nerve VII (facial nerve) is located within the temporal bone's facial canal. The tympanic part of the temporal bone surrounds the external auditory meatus, forming the canal that transmits auditory signals to the auditory nerve. The TMJ is a diarthrodial joint, as are many other joints in the human body, and comprises ligaments, a cartilaginous disc, a joint capsule, and a synovial membrane. As a diarthrodial joint, the TMJ is subject to inflammatory disorders, including degenerative arthritis, and movement of the TMJ may become quite painful. TMJ syndrome describes head, ear, and jaw pain; joint crepitus of the TMJ; joint dysfunction; and tenderness of the muscles of mastication. Joint crepitus is a sensation of grinding, grating, crunching, or popping upon movement of a joint. TMJ joint dysfunction is characterized by deviation of the jaw to one side on opening of the mouth and/or inability to insert 3 fingers vertically when the mouth is open. The jaw deviates to the side of a weak muscle, such as the pterygoids. The muscles of mastication are the masseter, temporalis, and pterygoids, all extending from the zygomatic and temporal bones to the mandible TMJ. Regarding TMJ pain, sensory innervation to the TMJ is provided by the mandibular branch (mandibular nerve; V3) of cranial nerve V (the trigeminal nerve). Muscle spasm related to the TMJ may involve the motor branches of V3, which supply the masseter, temporalis, and pterygoid muscles. Muscle spasm may contribute to substantial pain as a component of TMJ syndrome. TMJ syndrome may involve radiating pain, especially to the jaw line and ear, irritating the auditory canal. There may be aching facial pain, pain around and in the ear, and locking of the TMJ, interfering with normal opening and closing of the mouth. Chiropractic care is an especially important component of a comprehensive, holistic program of treatment for TMJ syndrome. Chiropractic care detects, analyzes, and corrects spinal nerve irritation and spinal joint dysfunction. In the case of TMJ syndrome, the vertebral joints of the neck and their associated spinal nerves may be specifically implicated. Additionally, using gentle manual procedures directed toward the TMJ itself, chiropractic care is able to relax and reduce muscle spasm in the jaw muscles surrounding the TMJ and help to restore normal TMJ mobility. 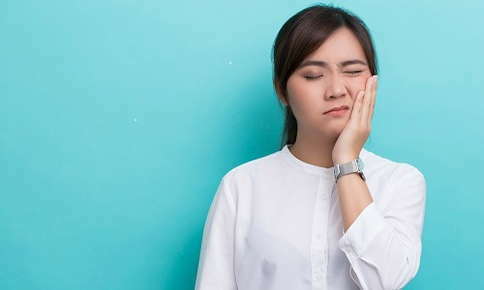 Additional treatment for TMJ syndrome may include use of a mouth retainer at night (nocturnal occlusal guard) to act as a "sling" and help prevent grinding of the teeth while asleep. As well, psychological counseling may be of benefit. Overall, chiropractic care provides specific treatment for TMJ syndrome. Your chiropractor may also recommend a restorative nutrition program and exercise routines to assist your overall recovery and return to optimal health and well-being. "1st time visit to a chiropractor and what an amazing experience. Dr Amoruso was beyond professional, extremely accommodating and was able to offer immediate treatment for my back issue. Thank you!!!"